Arthur Harry Sutton was born in York on 30 November 1892 to John, a regular soldier but later a draper, and Alice Sutton. In 1913 he married Bessie Gladys, the older sister of Thomas Hart Brinkworth, in the Farnham area. Harry followed the family tradition of enlisting in the Army at the age of fourteen and was one of five brothers to serve his country. He was an accomplished horseman and shared first prize in the rough riders display at the 1914 Naval and Military Tournament. 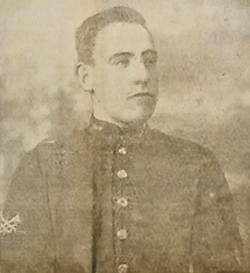 Following the outbreak of war Harry was deployed to France on 19 August with the 42nd Brigade of the Royal Field Artillery, and already a corporal. A month later he was awarded the Distinguished Conduct Medal : 'For gallantry and good work throughout the campaign. On two occasions he repaired the telephone under heavy shell and rifle fire.' Harry's actions, which earned him promotion to sergeant, included him leaving his trench whilst under heavy shell fire, and, without regard for his own safety, to rescue three wounded Gurkhas. Harry must have been amongst the 2/2nd Gurkhas who were in action around Neuve Chapelle during that early phase for his medal has 'Richebourg' named on it (the two places were just a couple of miles apart); Harry's battery, No. 45 in the 42nd Brigade RFA, was certainly acting as covering artillery for the part of the Indian Division in that sector. The DCM was presented twice, first by the Divisional Commander and then, notably, on 2 December 1914 by George V during a visit to the Western Front, the first time that a British king had been 'in the field' with his armies on campaign since George II at Dettingen in 1743! As one of the first awards of the war, the medal is extremely rare as Harry's details are engraved around the rim; those DCMs that followed were usually machine impressed at the Royal Mint. Further promotion for Harry followed. During the Battle of Pilckem Ridge (31 July-2 August 1917), the opening attack of the main part of the Third Battle of Ypres, Battery Sergeant-Major Harry Sutton was in sole charge of the battery wagon lines close to the Yser Canal. His 'untiring energy, courage and power of command' enabled the ammunition supply to be maintained despite heavy shelling and he also organised the successful evacuation of casualties to a place of safety. For this work Harry received a Certificate of Bravery from the General Officer Commanding 38th (Welsh) Division and was commended for his 'conspicuous gallantry and devotion to duty'. By February 1918 Harry had also been awarded the Belgian Croix de Guerre. Harry was transferred to the Army Reserve on 8 August 1919, and later received the 1914 Star, British War Medal and Victory Medal. His medals and their provenance were auctioned in 2000, a rare set which fetched £1,150; his medals and Certificate of Bravery may be seen in our Gallery. While Harry was serving his country, Bessie returned to Frampton to live with her parents, William James Hart Brinkworth and Patience Elizabeth née Williams, in Hart's Cottages from where Harry was recorded as an absent voter in 1918. His service is not remembered on the village hall plaque. In 1934 they lived in Kilburn and by 1939 were in Willesden, with Harry a ganger (foreman) on the London Transport railways. Arthur Harry Sutton died on 17 July 1954.